Kitty Scott is Director, Visual Arts at The Banff Centre, a post she has held since 2007. Previously she was Chief Curator at the Serpentine Gallery, London, and Curator, Contemporary Art at the National Gallery of Canada, Ottawa. 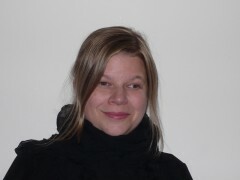 She has curated exhibitions of artists such as Francis Alÿs, Janet Cardiff, Paul Chan, Peter Doig, Ragnar Kjartansson, Silke Otto-Knapp, Ken Lum and Ron Terada, and is an agent for dOCUMENTA (13) (2012), Kassel. She organised the curatorial symposium Are Curators Unprofessional? (2010) at The Banff Centre and edited the publication Raising Frankenstein: Curatorial Education and Its Discontents (Koenig Books, Cologne, 2010). She has written extensively on contemporary art for catalogues and journals including Parachute, Parkett and Canadian Art. Scott has contributed to numerous books on curatorial studies and written texts for monographic publications on the work of Matthew Barney, Peter Doig, Brian Jungen and Daniel Richter; and for the publication Creamier: Contemporary Art in Culture (Phaidon, London, New York, 2010). As an independent curator, she has organized exhibitions including Bankside Browser (2000) for Tate Modern, London and Universal Pictures (1999) at the Melbourne International Biennial. Scott was the Canadian coordinator for the Seventh International Istanbul Biennial (2001) and also worked on the inaugural SITE Santa Fe Biennial (1995). She is visiting professor for the Curatorial Practice Program at the California College of the Arts, San Francisco, as well as an adjunct professor at York University, Toronto, and University of British Columbia, Vancouver.